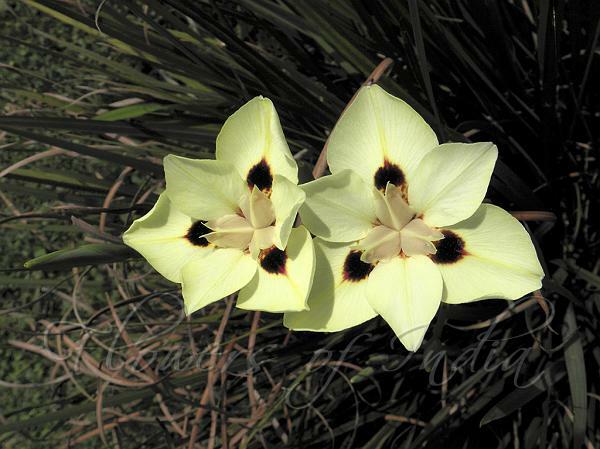 Fortnight Lily is an attractive perennial or small shrub which bears masses of cream-yellow or lemon-yellow flowers with dark brown spots in the centre. The flowers are borne on tall stalks above clumps of light-green strap-shaped leaves. They're about 2.5 inches across. The foliage is reminiscent of an iris - long, stiff leaves that grow in fans about 3 ft tall. Unlike most irises, however, the flowers appear on branching stalks at the end of the stems. Fortnight Lily is native to South Africa. Identification credit: P.S. Sivaprasad Photographed in Cherrapunchi, Meghalaya.